Home > News > Entertainment > Predicting the Future Price of Bitcoin: Is It Digital Gold? If you’ve been on the internet sometime in the last year, you have undoubtedly encountered Bitcoin, the digital payment system that, on the surface, appears just as radical and revolutionary as it does ethereal. Headlines about Bitcoin run the gamut. Some deride it as a financial instrument whose primary function is facilitating payments on the dark web; others declare it the future of finance, “the internet of money.” Many people see Bitcoin as the crux of a decentralized, utopian vision for the future of commerce, the impetus for creating a world separate from the pernicious effects of central bankers and inequitable wealth consolidation. However you view Bitcoin, the reality is that its value is highly volatile. In the course of a week, a day, or even an hour, it can take a massive nosedive or make a huge gain. There are knowledgeable people on both sides of that debate. But since we’re in virgin territory, it’s unclear whose knowledge is most pertinent. What we do know is that there are several potential occurrences that will either drive the price of Bitcoin up or down in the near future. For instance, if big financial institutions start investing in Bitcoin, it will gain legitimacy and its price will go up. On the other hand, if there’s a major security breach at a Bitcoin exchange, the public will lose confidence in the virtual currency and its price will fall. Below, we look at a number of these potential occurrences, setting the odds on their likelihood and predicting their impact on the price of Bitcoin. 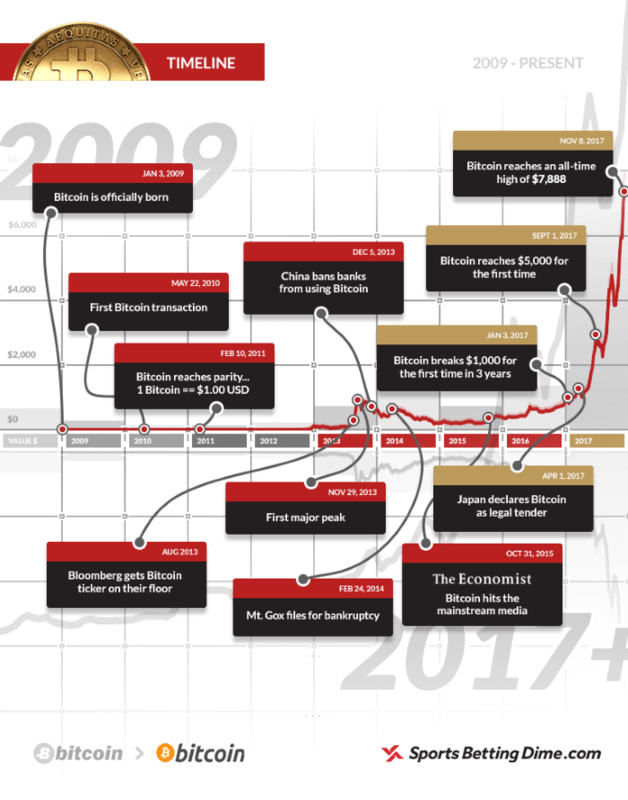 By looking at as many potential value-altering occurrences as possible, we hope to provide a sort of “map” as to Bitcoin’s potential growth or decline. Predicting the price of Bitcoin is impossible without understanding it, and understanding it is impossible without scrutinizing what influences and interacts with Bitcoin’s users, structures, and stated purpose. So, before we get into the predictions, some background is necessary on the nature of Bitcoin, itself. Comparing Bitcoin to the internet is an apt metaphor. It conveys the profundity underlying the disruptive potential of Bitcoin. Supporters of the virtual currency like to point out that technological luddites thought websites were a fad for geeks in 1995, but now the internet has infiltrated our lives to a degree that not even the most enthusiastic early proponents could ever have envisioned. The internet produced the likes of Google, Twitter, and Facebook, i.e. some of the largest and most immensely powerful companies to ever exist in the history of capitalism. The breadth of their influence is so prodigious that we can no longer live without the services they provide; the internet’s impact knows no borders, and nearly every attempt to restrain its power has eventually crumbled. Our everyday existence is utterly inextricable from the internet. Bitcoin aims to do the same for money as the internet did for communication. In his now famous ”White Paper,” which stipulated the aims of Bitcoin, the legendary creator, Satoshi Nakamoto, laid out his plan for a purely peer-to-peer version of electronic, internet cash, one where online payments could be sent from one user to another, without any third party oversight at all. Bitcoin is probably best viewed as a protocol (a set of code) that delivers data (Bitcoins, which have a monetary value) to users in pre-defined quantities (blocks) ingrained in a mathematical sequence (the blockchain) all stored on a decentralized global network of computers running Bitcoin software. The “blockchain,” a brilliant and open-sourced algorithmic formula, guarantees irreversible transactions, authenticated by a peer to peer network. Its code was made available to everyone. The blockchain has nearly limitless potential applications, from reshaping tourism to acting in the place of an escrow agent. It might be hard to believe, but Bitcoin is the first major innovation in money in the last 400 years (since the Bank of Amsterdam, the first institution to act as a centralized clearinghouse and issue national notes and currencies, was established in 1609). Bitcoin meets the test of what money is; it is at once divisible, fungible, verifiable, and finite, despite existing wholly digitally. A purely digital currency or commodity is hard to conceptualize, without a doubt; the most obvious and basic descriptions of Bitcoin invoke images of something shady and fraudulent based on an invented worth, like a pyramid scheme. While it is relatively easy to appreciate Bitcoin intellectually, it is much more difficult to comprehend it intuitively, in our guts. It is hard to understand Bitcoin within the existing conceptual metaphors we use to understand the financial industry. No large, national bank supports it; it does not have a physical form; and nothing guarantees it but a cryptographic algorithm. Bitcoin may be able to function like money, yes, but it is certainly not money in the form that we know and externally understand at our current moment in time. If this sounds confusing, that’s because it is! Irrespective of its iconoclastic origins, Bitcoin is garnering some serious attention right now; everyone from A-list celebrities to noted investors seems to have a strong opinion on it. Jamie Foxx, Floyd Mayweather, DJ Khaled, and even Paris Hilton are promoting cryptocurrencies. While Paris Hilton may be desperately grasping at any semblance of relevance, the more important reality is that cryptocurrency is trendy enough to be her vehicle of choice for capitalizing on the last remaining vestiges of her fame. These celebrities might be bullish, but some well-noted experts are bearish, with Jamie Dimon famously declaring Bitcoin a “fraud,” and Warren Buffett making a similar declaration. These are some heavy hitters in the financial world, with some very serious clout, and they are predicting Bitcoin’s demise. Despite this derision, we’re inclined to side with Paris Hilton; Bitcoin has shown an ability to shrug off everything that’s been thrown its way since its inception in 2009. It’s currently accepted as a payment method everywhere from sportsbooks to Whole Foods, along with hundreds of thousands of other merchants, online and otherwise. Declared dead countless times (181, to date), Bitcoin continues to ascend in value, steadily gaining users around the world. The old aphorism rings true: what didn’t kill it, made it stronger. Why has Bitcoin been successful? That’s a difficult question to answer. It breaches the important laws of technology investing; it is not cheaper, better, or faster as an application. Yet many are willing to overlook this and go beyond the standardized, categorical value judgments of investments; they are eager to give the seditious potential of Bitcoin a chance. William Gibson famously declared “the future is already here; it is unevenly distributed.” Maybe this is the right interpretive lens to apply to Bitcoin and its theoretical scope and scalability. Certainly, we think that Bitcoin is the future, and it exists among us already, just not quite all of us yet. Bitcoin has tremendous utility in the developing world, especially in regions where central banks have historically let down their citizens and in areas where the rule of law is weak and ineffective. When Cyprus’ national bank crashed in 2013 and depositors could no longer rely on it, the price of Bitcoin surged upwards, recording exponential growth. Cypriots transferred funds so quickly that Mt. Gox’s servers overloaded and crashed. (Mt. Gox was the highest-volume Bitcoin exchange in the world at the time.) This influx of capital into Bitcoin amounted to a “bail-in” on Bitcoin. Greece’s financial crisis had a similar effect, leading to a rise in the price of Bitcoin and Bitcoin transactions. With global, neoliberal finance emphasizing a few major fiat currencies and record low interest-rates, it’s not hard to imagine a ripple in the presently stable international economic climate having a profound impact on the economy of a smaller nation. The placid, hyper-stable global market is more susceptible to the slightest dip downwards than at any point in history, and a drop of even a few percentage points in a few financial sectors could potentially trigger a chain of catastrophic events for a modest-sized nation’s currency and overall economic stability. If history is any guide, this scenario could lead to a significant surge in the price of Bitcoin. Bitcoin is also currently providing benefits in suffering economic zones where the local currency is hyper-inflated. Take Venezuela, for example, which recently implemented a dreadfully misguided monetary policy. Instead of plying a traditional trade for nearly valueless bolivar, many Venezuelans have turned to Bitcoin mining. Electricity and a working internet connection are all they need to mine Bitcoin. Subsequently, they can use this Bitcoin to purchase necessities like food and diapers; providing for their loved ones is made possible by just being a contributing node in Bitcoin’s network. Venezuelans are not the only ones eschewing local currency for Bitcoin. In East Africa, locals are using Bitcoin in cross-border transactions; in Nigeria, Bitcoin is emerging as a viable alternative to the repeated failure of the country’s fiat currency; and in Zimbabwe, many use Bitcoin as a de facto savings account, after the central bank collapsed under the weight of hyperinflation in 2008. Family members working abroad can also quickly and easily send money to their families with Bitcoin, and local activists can receive money from foreign supporters, free of any capital controls. This speaks to the utopian potential that many of Bitcoin’s hardline supporters preach: ordinary people, regardless of circumstance, are financially incentivized to keep the network functioning. It’s a perfect cryptographic positive-feedback loop in which miners benefit and the network strengthens. Ultimately, the more people around the globe using Bitcoin as a medium of exchange, the stronger the currency will be; an increased pool of transactors and participants will inevitably drive up the price of Bitcoin, and the chances that more and more people will start to interact with Bitcoin is high. Bitcoin mining does not privilege any single computer over any other, so everyone with an internet connection has some incentive to become part of the Bitcoin network. Bitcoin is garnering a reputation as “millennial gold.” This label has its origins in the fact that Bitcoin possesses many of the same benefits as gold: it is not issued or sanctioned by any government, and it is fungible, durable, portable, apolitical, inelastic, divisible, and scarce. What makes it unique is it exists only digitally, hence its association with millennials. Our economic paradigm is slowly but surely shifting from the physical to the digital. Myspace, the world’s first online social network, launched in 2003; now, 14 years later, Facebook has billions of users across the globe, and nearly all of our personal information exists in a “cloud.” For most people, it’s difficult to imagine a world where our primary source of information isn’t Google or Facebook or the like. As the world gradually shifts from the physical to the digital, a new class of commodities is emerging: digital commodities. Computing power, storage capacity, and network bandwidth – these are the fundamental building blocks of the services that now govern our lives. When transposed onto Bitcoin’s blockchain, they are crypto-commodities; as they are required for the Bitcoin network to function, they imbue the currency with inherent value. Further, Bitcoin has a fixed, finite supply, and requires expenditure to acquire – just like gold. It is not an accident that those who run Bitcoin software are nicknamed “miners.” Evidently, Satoshi Nakamoto and early proponents of Bitcoin saw the parallels with gold from the outset. The concept of “digital gold” might seem bizarre at first glance, but the comparison is apt. Gold’s value goes far beyond its utility; the value of gold is predicated on individuals and institutions holding gold as an asset, as a real store of value. In other words, theoretically, gold’s value is equally as speculative as Bitcoin’s, and could quickly vanish. World-famous economist and Nobel laureate Robert Shiller recently suggested that the rapid rise in Bitcoin prices has shown many of the hallmarks of a classic financial bubble. However, he also noted that gold is in the midst of a 5,000-year bubble, by his definitions. What gold has on its side is exactly that — a 5,000-year history as a store of value — whereas Bitcoin has existed for about nine years. There’s no doubt that more time must pass, and a lot more trust must be built, before Bitcoin’s status as digital gold becomes crystallized. But it’s interesting to note that on November 7th, 2017, the search term “buy bitcoin” eclipsed “buy gold” in popularity. Currently, the most prominent driver of Bitcoin’s price increase is the CME (Chicago Mercantile Exchange) announcing its intention to create a Bitcoin ETF (Exchange Traded Fund) before the fourth quarter of 2018. The announcement gave Bitcoin an air of security and legitimacy, and more importantly, stability. Big-money investors can now get involved in Bitcoin through familiar conduits; it’s important to remember that, on Wall Street, a majority of trades still close over the phone. These two sages of the financial world believe that ETFs, and the creation of further financial assets derived from cryptocurrencies, can shift the narrative of Bitcoin being a haven for criminals, money launderers, and other kinds of shady characters into one of Bitcoin as a revolutionary new financial instrument. These exchanges will lead to less volatile price swings, further acceptance, and new opportunities; the sky is the limit. Cryptocurrency is a whole new market on Wall Street, one that is likely to give Bitcoin a boost, as there is a desire for alternatives to traditional safe havens like US dollars, gold, and the S&P 500. A hard fork is a permanent divergence in Bitcoin’s blockchain; it results in two different paths, one which follows the new, forked blockchain, and one which continues down the old Bitcoin blockchain. Hard forks happen when a faction of Bitcoin miners fundamentally disagrees with a certain portion of Bitcoin’s code, and they know they will not be able to enact a change on Bitcoin, itself. But we won’t worry too much about the motivations behind hard forks. Instead we’ll focus on the impact. Hard forks create “Newcoins” and, without delving too deep into the technical side of things, Bitcoin owners will usually end up with an equal amount of Newcoin as they hold in Bitcoin. The fork does not, in and of itself, cost anything to anyone. As just mentioned, you will have the exact same number of Bitcoin before and after the fork. But now you will also have “Newcoins,” which are, effectively, a new currency, wholly separate from Bitcoin. Sometimes the Newcoins generated from a hard fork are worth a little, sometimes they are worth a lot, and sometimes they are worth nothing. Like the value of Bitcoin, itself, it all depends on how much people are willing to pay to acquire them on the open market. A proposed Bitcoin “hard fork,” dubbed SegWit2x, just failed on November 8th. This failed fork would have been the largest, most public, and most contentious split in Bitcoin to date. Even if it goes ahead at some point in the future, it is unlikely that SegWit2x (or any other proposed fork) will emerge as the “new” Bitcoin, and further divisions of Bitcoin’s blockchain will likely drive up the value of “Legacy Bitcoin” (a term used by SegWit2x developers to describe the Bitcoin that currently exists). The technical aspects of SegWitz2x were complicated – in essence, it would have upgraded the block size on the blockchain from 1 megabyte to 2 megabytes, increasing the speed of transactions and making Bitcoin and the blockchain itself more conducive to widespread adoption. How to approach the issue of block size has driven an ideological wedge within Bitcoin communities, as many do not agree that Bitcoin is ready for such a significant upgrade to its critical infrastructure: the block. The crux of the divide is that proponents of SegWit2x did not agree to institute replay protection, and as a consequence, left “Legacy Bitcoin” susceptible to malicious infringement. SegWit2x developers stated they were intentionally leaving the previous iteration of Bitcoin vulnerable; they sought to become the de facto “Bitcoin.” The reality is that the preponderance of Bitcoin users was not willing to let this happen; many consider SegWit2x’s failure an affirmation of the true democratic nature of the Bitcoin community. A few interested actors cannot dictate the future of Bitcoin against the wishes and without the consent of the masses. An upgrade to the block size and Bitcoin’s scalability is coming soon, no doubt; but the update will not have such a bellicose character. A recent article by Ariel Deschapell succinctly described the disagreement, stating, “[t]he choice between the legacy bitcoin and 2x is a choice between a continuously proven and non-censorable store of value, and a provenly compromised store of value with temporarily lower transaction fees.” Bitcoin users, many of whom have already invested so many resources in Bitcoin, were unwilling to abandon the original code of Bitcoin and partake in such a severe risk. What the decision comes down to is basic human psychology at work within the highly participatory, open-source world of Bitcoin; the crowd is heading towards the safer option. The divisiveness of SegWit2x aside, Bitcoin forks have the potential to benefit Bitcoin owners. They have the potential to function as dividends, like those paid to corporate shareholders. When a fork creates a new cryptocurrency (for our purposes, Newcoin), the best case scenario is that the Newcoin has some value and that there is no corresponding drop in the value of Bitcoin. If that’s the case, Bitcoin holders have been rewarded with a currency they can trade, exchange, or hold on to. There are a lot of technical details about accessing your Newcoin, but it is certainly not rocket science, only asymmetrical cryptography. Another way to think of Newcoins is like Bitcoin offspring. All organisms derive benefit from creating offspring, and SegWitz2x, Bitcoin cash, Bitcoin gold, and other similar forks in Bitcoin’s protocol reinforce the strength and permanence of their parent, which is why, historically, forks have built confidence in Bitcoin’s reliability and security and led to an overall increase in value. Bitcoin has gotten in its fair share of trouble over the last few years. Not only is it stigmatized for being favored by criminals, but national economic planners aren’t too happy that Bitcoin resists so much regulation and, perhaps most importantly, taxation. Bitcoin’s volatility and decentralization are viewed as a threat to existing national monetary systems, and thus stability, in the following countries: Vietnam, Russia, Bolivia, Kyrgyzstan, Ecuador, and China. Bitcoin’s legal status in Russia is still murky, but we would tend to say that it’s technically illegal within the confines of Putin’s empire. Regardless of Bitcoin’s legal status, the fact is that there’s no system to either regulate it or effectively ban it. For reasons we don’t need to rehash, Bitcoin’s nature makes it nearly impossible to restrict. Second, it is well known foreign travel by Chinese citizens has surged in response to the crackdowns on capital flight. Any Chinese citizen traveling to the US or Western Europe can easily purchase at any one of several thousand public ATMs selling the cryptocurrency. While China’s situation does not identically mirror that of other nations, it has many parallels elsewhere; stemming the flow of Bitcoin is an arduous task for any country. Bitcoin’s value has shrugged off individual nation’s condemnations time and time again, and there is reason to think that its ascension in the face of legal adversity is the norm, not the exception. Bitcoin is, after all, capital, and capital always finds a way. Since September 2017, there have been persistent rumors that Amazon plans to adopt cryptocurrency payment platforms; there is an online petition requesting the same. The rumors (suggesting that Amazon would start to accept Bitcoin before the end of October) did not come to fruition, but hope remains as Amazon registered three domains – including “amazoncryptocurrency.com” and “amazoncryptocurrencies.com” – on October 31st. Registering these domains is not tantamount to an acceptance of Bitcoin, but it suggests that Bitcoin is on Amazon’s immediate radar and that the company is investigating its potential. Amazon is one of the largest and most influential businesses on Earth, and it has an unrivaled amount of clout in the world of online commerce. If Amazon were to adopt Bitcoin payments, a swath of other online merchants would likely follow in its footsteps. With wider online acceptance would come increased awareness, and subsequently normalization, of Bitcoin. It’s not difficult to imagine how a world friendly to Bitcoin purchases would result in broader use of Bitcoin, reducing its volatility and driving the overall value upwards. Amazon earned $27.98 billion in revenue last year; if Bitcoin comprised even a small fraction of that, its value would benefit tremendously. There’s no question that Bitcoin is gaining momentum internationally. The European Union, Australia, and Canada have legally recognized Bitcoin as a form of currency, or more specifically a legitimate medium of exchange. The United States has taken official acceptance of Bitcoin even further, not only recognizing Bitcoin as legal tender but also sanctioning the CME’s upcoming Bitcoin ETF, as we discussed earlier. Bitcoin is a legal currency in Japan. Switzerland’s financial market regulator just authorized a Swiss bank to manage Bitcoin for its clients. India, South Korea, and even Russia are closing in on the creation of institutional frameworks for absorbing Bitcoin into their financial systems. It’s easy to see the appeal beyond mere taxation and regulation, especially for governments and large financial institutions; under the right circumstances, mining Bitcoin can be up to 10-times more profitable than pumping oil. The founder and head of highly lauded firm Standpoint Research, Ronnie Moas, issued a report in early July which rightly predicted Bitcoin reaching $5,000 within a few months. His price predictions did not stop there; he wrote that he has “little doubt that 1% of the money in cash, bonds, stocks, and gold will end up in cryptocurrencies.” At the time of his report, the $80 billion cryptocurrency market (of which Bitcoin holds the clear majority) was just 1/25 of 1% of the money in cash, bonds, stocks, and gold. Thus, digital currencies will need to increase 25 times to reach that 1%. Should cryptocurrencies encompass a significant portion of asset allocation models worldwide, currencies like Bitcoin stand to increase 100 times in value. Similarly, Fundstrat’s Tom Lee projects that the value of one Bitcoin will be as high as USD $25,000 by 2022, on the strength of further institutional backing and consolidation. These are audacious predictions, without a doubt, but it is difficult to argue with where Bitcoin is heading; it has made tremendous gains and is poised to make more. If you’re still skeptical, remember that in the 1970s, no one thought that trading currency could be a valid financial instrument, and this now comprises one of the most significant financial markets in the world. The genesis block was the first transaction in Bitcoin history, and embedded within that block is a headline from the Financial Times. Clandestinely placed within the coinbase parameter of the transaction, the text reads, “The Times 03/Jan/2009 Chancellor on brink of second bailout for banks.” Beyond communicating Satoshi Nakamoto’s frustration with central banking’s systemic ineptitude, the text hints that Bitcoin’s still anonymous founder developed Bitcoin as an alternative asset in the case of global financial crisis. What if Deutsche Bank collapses? What if we have another “Lehman Moment?” What if trading algorithms do not perform the way their creators intended when the market inevitably corrects, causing a crash that impacts more people than ever before? It is difficult to predict what impact a truly catastrophic financial event would have on Bitcoin’s price; there is no historical precedent. That said, given Bitcoin’s positive response to major financial stressors (Brexit, the election of Donald Trump, the aforementioned national economic meltdowns in Cyprus and Greece) we are optimistic that Bitcoin’s price would surge. Bitcoin has proven exit value. The first sign of an impending crisis is that banks, hedge funds, and various other financial institutions and groups start liquidating assets for cash to meet their margin calls; this is integral to preventing insolvency. We saw this in 2008 when gold, Bitcoin’s physical analog, received a ton of action both in the build up to and the wake of the financial crisis. In the months surrounding the 2008 crisis, gold went from close to USD $1,000 to USD $750. However, its performance was much stronger on a longer timeline, especially when you compare it to the conventional financial indexes that measure the overall strength of global finance. From October 9th, 2007, to March 9th, 2009, the S&P 500 declined 56.8%, while in the same period gold went up 25.5%. It is a reasonable assumption that Bitcoin would perform in a similar fashion, eventually seeing gains as the broader market suffered massive depression. However, that is certainly not a guaranteed, and how Bitcoin’s price would be impacted by a similar (or larger) crisis depends, largely, on what happens in the interim with Bitcoin. If Bitcoin’s volatility goes down on the strength of an influx of institutional capital, Bitcoin will no doubt be perceived as a safe asset in the event of a crisis; its price will shoot up. This thesis is strengthened by the fact that, as an asset class, Bitcoin is totally separate from the interconnected world of equity, bonds, real estate, and other conventional financial investments. However, if Bitcoin was to somehow become increasingly volatile (no credible signs point to this, as of now) it is unlikely that capital would flow into it in the event of a significant financial disaster. Immediately following a crash, it’s also possible that people will use the cash received from selling assets to meet their margin calls, doing so at such a torrid pace that it will have a huge deflationary effect on fiat currencies. This would lead to Bitcoin’s cash price dropping (as Bitcoin’s value is most often measured against USD). Such a drop in price would be wholly unrelated to Bitcoin, itself, and entirely correlated to the price action of fiat currency. There’s also a chance people would sell their Bitcoin to meet their margin calls, in which case Bitcoin’s value could drop from the sudden liquidation. However, as we mentioned above, Bitcoin’s value would likely rebound, given enough time. In the wake of crises, central banks have employed monetary policies such as the establishment of incredibly low (in some cases negative) interest rates, and policies such as quantitative easing to flood the market with dollars; the subsequent inflation this would cause would likely drive Bitcoin’s price up. Another factor that bodes well for Bitcoin is that it has a tremendous amount of purchasing power, arguably beyond that of gold. We have seen this purchasing power in a depressed economy in Venezuela, and it is likely that Bitcoin would be able to act as a medium of exchange in a global crisis. But it is impossible to know if this would remain true in the event of a “black swan” event, one occurring on a much larger scale than the events within Venezuela. Also worth noting is that if the crisis is large enough to have serious political implications, Bitcoin would likely climb. Whenever the public loses faith in the long-term efficacy of the rule of law, Bitcoin’s price goes up. Bitcoin was designed to function in the wake of a collapse, a truth that is forever etched into the genesis block. 9. Bitcoin goes the way of the tulip, Pets.com, and dot.com stock; it’s a bubble! For every notable Bitcoin bull, there seems to be a Bitcoin bear, i.e. someone who thinks that Bitcoin’s similarities to historical market bubbles are patently obvious, textbook even. There’s no doubt that whenever there’s a massive upsurge in price on a relatively new product, both bulls and bears come out with strong opinions. Opinion on Bitcoin, in particular, seems to be bifurcated into major optimism and extreme pessimism. Both views are worth taking seriously, but a denial of Bitcoin is foolish in the face of the facts; people who say no to new technologies with Bitcoin’s potential are not often on the right side of history. Look no further than the internet for an example. Bitcoin bears love to use the “Tulip Bubble” as a comparison. At the turn of the 17th century, there was an influx of wealth into the Netherlands. The country was entering what historians refer to as “The Dutch Golden Age,” and it was one of the wealthiest nations in the world. Tulip bulbs entered the Dutch economy at around the same time, and they were one of the few exotic flowers that could withstand the relatively harsh climate of the Netherlands. Consequently, they surged in popularity, not only in the Netherlands but in France and other rich locales throughout Europe; nobility paid obscene sums of money to let their wives adorn themselves with tulips at high-class balls and soirees. Tulips became a status symbol. Despite its importance all over Europe, the tulip trade was consolidated in the hands of a few Dutch businessmen. It did not take long for the more dynamic and industrious amongst these Dutch businessmen to start trading and collecting tulip bulbs for profit, creating inflated and artificial markets for tulips. In 1623, a single tulip bulb was priced at close to 1,000 Dutch Guilders, while the average annual income in the country was 150 Guilders. In February 1637, the tulip trade evaporated; within a single week, prices plummeted, and both investors and merchants were left with almost valueless bulbs. Many had also sold futures contracts for bulbs they did not possess, to people who could not afford them; the reverberations of this crash were felt all over Europe. The tulip craze is a classic example of a “speculative craze,” one where value becomes predicated on what, in essence, is the false wisdom of the crowd and their obviously implausible and irrational views on future values and prices. The tulip bubble was caused, chiefly, by three main factors: (1) a sharp increase of capital, (2) a tightening supply of bulbs, and (3) a manufactured demand for the product by traders who were speculating on higher prices. It is important to note that none of these factors, save the last, are in any way applicable to Bitcoin. Tulips are a physical product, and they had a clear utility as a luxury item for nobility. Tulips are perishable, susceptible to disease and other destructive factors; their value is entirely predicated on beauty, something that is wholly subjective. Bitcoin is proven as a payment mechanism, and as a store of value, something that Tulips never were, even at the height of speculation. Another cautionary tale parroted by those who don’t believe in the survival of Bitcoin is the infamous Dot Com bubble at the turn of the 21st century. These comparisons are easily dismissed; the dot-com bubble was predicated on the promise of a new technology, the internet, but the relevant entities (like Pets.com) had enormous expenses that significantly eclipsed their revenues. It does not take a genius to figure out that this is an unsustainable business model, and that it was bound to fail unless their margins were fixed. Bitcoin bears no resemblance to this; it is not a business, and it is not using specious metrics to obfuscate plainly bad numbers. Mike Novogratz, lauded as “the king of cryptocurrency” in certain circles, has an interesting perspective on Bitcoin’s relationship to major historical bubbles. “Remember, bubbles happen around things that fundamentally change the way we live,” he said. “The railroad bubble. Railroads really fundamentally changed the way we lived. The internet bubble changed the way we live. When I look forward five, ten years, the possibilities really get your animal spirits going.” Dot-com businesses were not sustainable, and they collapsed; this was not tantamount to the internet collapsing. In fact, quite the opposite happened. Perhaps Bitcoin’s price won’t go to the moon, but it is apparent that the currency, itself, is built on a lasting foundation. Bitcoin exchanges have proved vulnerable in the past, and there have been several high-profile security breaches in the last few years. When Mt. Gox (the world’s most important exchange at the time) entered insolvency in February 2014 after years of repeated security breaches, the losses were staggering: almost 750,000 of customers’ Bitcoins were lost, in addition to 100,000 of the exchange’s Bitcoins (amounting to roughly $473 million worth). Those 850,000 stolen Bitcoin represented nearly 7% of the world’s supply at the time, and the theft drove down the price of Bitcoin significantly. Bitstamp, another exchange, lost close to 19,000 Bitcoins ($5.2 million at the time) in 2015 at the hands of malicious hackers. Bitfinex was broken into on August 2nd, 2016, and roughly $72 million in Bitcoin disappeared; the price of Bitcoin subsequently dropped almost 20%. The Bitcoin community is an enterprising and industrious bunch, dedicated to making Bitcoin a safer and more user-friendly experience. No one involved in Bitcoin legitimately wishes to see another major attack on an exchange; in the end, everyone involved in crypto suffers when this happens. The community has both consolidated and collaborated on Bitcoin security in the wake of every major breach, and while there is obviously still risk associated with Bitcoin’s exchanges, this risk is smaller than it ever has been before. Consuming the news in the 21st century is a lot like watching the Twilight Zone in the 1960s; the media is incentivized to project various iterations of dystopia, and these portrayals are imbued with an acute surrealness. Bitcoin, with its utopian potential, might be grabbing a few headlines that are contra this narrative, but like anything else, Bitcoin is not without its vulnerabilities to the more significant happenings of our world. What if there’s a nuclear war with North Korea? What if there’s cyber attack on a scale that many thought inconceivable? What if the Solar Flare we’re due for sometime in the next thousand years comes tomorrow and wipes out our internet connectivity, causing worldwide famines and other such chaos? What if Ted Kaczynski was right, and the singularity consumes us all? The chances of any of these things transpiring are next to nothing, but rest assured that if any one of them happens, Bitcoin and just about everything else is going to go the way of the Dodo. Instead of dwelling on low-probability pessimism, perhaps one should follow the words of Albert Camus and say, “if you trust life, life has to answer you.” We wouldn’t bet on Bitcoin going anywhere. There’s a famous anecdote about the world’ (second) most famous physicist, pioneer of atomic structure and quantum theory, Neils Bohr. Shacked up in his home in Copenhagen, deep in his work, one of his colleagues dropped by to say hello. Upon entering Bohr’s home, he noticed a horseshoe resting overtop of his stove, one that was known among the Danes to bring about good luck and to usher away evil spirits. His peer immediately confronted him, flabbergasted that one of the most brilliant men to ever live, someone pushing the bounds of human knowledge every day, would place any weight at all on something so objectively meaningless and utterly symbolic. Bohr’s response was nothing short of poetic; he coyly replied, “I don’t believe in it either. I have it there because I was told that it works even when one doesn’t believe in it.” Bohr went on to continue his work as one of the dominant minds of the century, and he lived a full, long, and healthy life. Maybe it was the horseshoe. Maybe not. Perhaps this is the right way to approach Bitcoin, as no one can say with absolute certainty that they understand Bitcoin’s projections; no one can predict the future. Truly grasping a brand-new technology, from its function to its structure to its myriad applications, is difficult, and many who claim to understand these things and their direction do not. But most markers on our Bitcoin road point in the same direction: up. We may not know precisely how Bitcoin’s value will oscillate, but we’re confident in its potential. Bitcoin may appear, on its surface, to be little different than other passing technological fads, something ostensibly solid that will eventually melt into air. But Bitcoin, and the blockchain, are truly revolutionary vehicles that have no true comparator in the history of finance, and we’re willing to bet our hard-earned paper money on the intangible cryptocurrency.